'Doxa' (Hans Peter Sass, R. 1929) IB. Early bloom. Color Class-S6L. Note: Also listed in IB web: 'Doxa'. 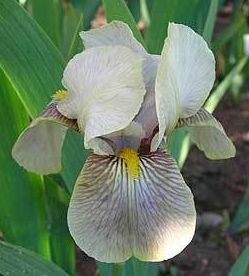 From Supplement To The Comprehensive Checklist of Aril and Arilbred Iris by Sharon McAllister, April 2000: DOXA DIS (Sass, R.1929). I susiana X ? Sdlg # NIA. IB, early. AIS Color Class:!S6L (yellow squalens with bitone pattern. Vallette: "large olive-cream, oxblood signal." Notes: pedigree from Vallette, which implies it was recorded with ASI; reason for disenrollment unknown. Ref: AIS '39, p. 198; Vallette, p. 176.